Houghton Mifflin Harcourt, 9780544206700, 352pp. 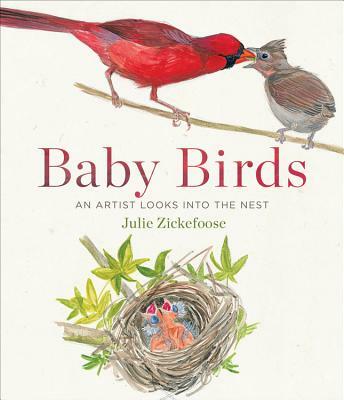 This beautiful book is as much an art book as it is a natural history, something readers have come to expect from Julie Zickefoose. More than 400 watercolor paintings show the breathtakingly swift development of seventeen different species of wild birds. Sixteen of those species nest on Julie's wildlife sanctuary, so she knows the birds intimately, and writes about them with authority. To create the bulk of this extraordinary work, Julie would borrow a wild nestling, draw it, then return it to its nest every day until it fledged. Some were orphans she raised by hand, giving the ultimate insider’s glimpse into their lives. In sparkling prose, Julie shares a lifetime of insight about bird breeding biology, growth, and cognition.